The first Outrageously Fresh specialty tomato mason jar bags are rolling off the line this week at SunSelect’s Tehachapi, Calif. facility, signifying the first step in a larger plan for these packs to become the bag of choice at retail—in the greenhouse section and beyond. A unique partnership between British Columbia’s SunSelect Produce and Danish company Schur Star Systems, Inc.—the originator of the mason jar shaped bag—positions the pack style to contain more than the greenhouse mini cucumbers, mini peppers and snacking tomatoes unveiled along with Divemex and Oppy at Fresh Summit last fall, according to SunSelect Director Reinhold Krahn. SunSelect’s exclusive includes peppers, cucumbers, tomatoes, cherries, red and green grapes, cranberries, apples, kiwifruit, and blueberries, with potential extensions of the jar bag concept for other products. In the coming months, SunSelect and Oppy will offer the concept to producers of many of these items. The “Schur Jar Bag” was discovered by members of the Krahn family, owners of SunSelect, at Fruit Logistica last year. Hans Christian Schur, Schur’s Oceanside-Calif. based CEO, shares Krahn’s enthusiasm about the partnership and the promise of the bag concept for many types of fresh fruits and vegetables. 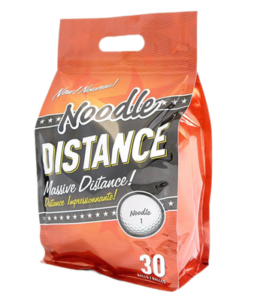 Schur specializes in developing and engineering new bags, innovating in both material and in shape, and serves as a “one stop shop,” manufacturing the packs and providing the equipment to fill them. 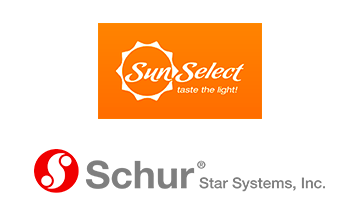 The Schur Star packing process is underway now at SunSelect’s Tehachapi, Calif. greenhouse, teeing up the delivery of the first jar bags filled with Outrageously Fresh snacks. 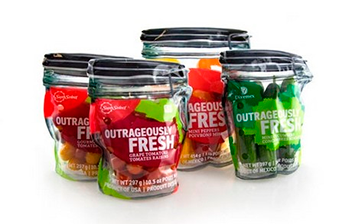 The re-sealable Outrageously Fresh mason jar bags include: 10.5 oz, grape, cherry and gourmet medley tomatoes grown by SunSelect, 14-oz. mini cucumbers, and 1-lb mini peppers grown by Divemex and are available exclusively from Oppy. In its second year with an office in California, Schur Star Packaging Systems is further establishing itself as a provider of packaging machines and flexible bags for the fresh produce industry. Schur Star Systems has been awarded by the British multinational grocery and general merchandise retailer Tesco with the “Tesco Value Award”. 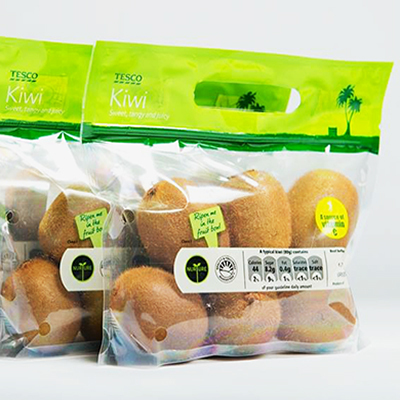 Tesco awarded Schur for their flexible packaging concept and in recognition of its expert assistance to launch new flexible packages for plum tomatoes and sweet mini peppers. 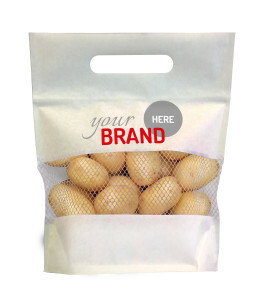 Schur Star Systems develops innovative packaging solutions for better perceived products at the point-of-sale. The idea of “Fresh `n` Go” is a new solution to make fresh products such as fruits and vegetables much more attractive in supermarkets. Schur is an international team of 16 companies offering packaging, packaging systems and consumer products. The Schur family has been at the head of the company for more than 165 years promoting innovation and a diversity of packaging and technical solutions tailored to customer needs. Schur has a staff of approx. 850 persons employed in Denmark, Sweden, Norway, Germany, France, Benelux, Poland, Spain and the USA. Schur Star Systems operating out of Flensburg, Germany and Chicago, USA are today utilizing the knowhow within the entire Schur Group to supply our customers worldwide the highest standards of flexible packing material.